Two Timebus Open Platform Routemasters, with bus conductors, will run a special service over route 139 between Trafalgar Square and West Hampstead on this date. RM 29 was the very last route 139 Routemaster: ten years ago, on 27th March 1998, after which one person operated vehicles took over. 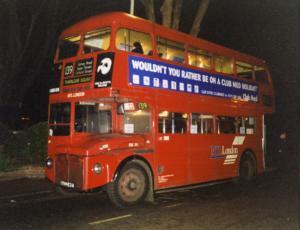 The other bus running, RML 2310, also used to work on route 139 right from its inception until March 1998. Route 139 began in March 1992, replacing the northerly section of the route 159, and was operated by London Northern Routemasters between Trafalgar Square, West Hampstead and some services continued on to Golders Green. These were based at Chalk Farm garage, although when that closed in July 1993, the allocation moved to Holloway. Under the privatisation of London Transport, operation of the route passed to MTL London in October 1994. A decade ago, RM 29 was running with a worn out AEC engine and tatty original interior (as seen on the last day photo, above, by A. Cornish), but since then the bus has been totally modernized and improved. Connections to the daily Routemaster heritage routes 9 and 15 can be made at Trafalgar Square, from where the London Transport Museum is also a short walk. Don't forget: British Summer Time begins on this date. These services are provided free of charge by Timebus with PSV licensed and insured vehicles, however, they are not part of the London Buses network. Passenger admission cannot be guaranteed. Services are subject to traffic conditions and vehicle availability. Please be careful when boarding or alighting from these open platform buses. Please do not eat, drink or smoke on board. Photographers, please do not cause delays!